The sailing area to the north of Dubrovnik will give you a great sailing holiday, with highlights of a Dubrovnik sailing itinerary including the fortified towns of Dubrovnik and Korčula as well as quieter 'off the beaten track' stop-offs on islands including the national park on Mljet. This area offers a quieter and more laid-back yacht chartering experience than the Split region further north, although there are still plenty of things to see and do along the way. Request a charter quote from The Big Sail and we'll recommend the best sailing destinations for you. Stock your charter yacht & unpack, then explore this beautiful old town with it’s baroque buildings and ancient city walls. Take the cable car from the back of the town and take in spectacular views from the top, then take a walking tour or simply go up onto the city walls and see the city from every angle. Enjoy dinner with a stunning view over the Adriatic, then explore some the city’s bars & restaurants – many are hidden within it’s walls. Situated towards the middle of Mljet Island (pronounced ‘meet’), Okuklje is a good distance away from Dubrovnik for a first day’s sail. This little tucked away bay is host to lots of restaurants, although our favourite is Restaurant Maestral, a short walk around the bay away from your yacht, which has fantastic food and a stunning view of your moored yacht as the sun sets. Sometimes referred to as a ‘mini Dubrovnik’, Korčula is a medieval town buzzing with restaurants & bars, on an island known for it’s vineyards and wine production. There is a huge choice of restaurants for the evening – it is worth booking a table as tables for large groups can be hard to find. The thing to do here is to taste some of the local wines, wether that’s simply in a restaurant at dinner, or in a wine-bar for a tasting session, or there are also tours that will drive you to a selection of Korcula’s vineyards, so you can learn about Croatian wines directly from the local producers. Sveti Ivan is a beautifully turquoise anchorage, with it’s shallow and protected water giving it it’s colour and also making it one of the warmest bay’s to swim in! Drop anchor, swim and explore this beautiful and tranquil place, and watch a stunning sunset – the bay opens to the west giving a perfect, unobstructed view. 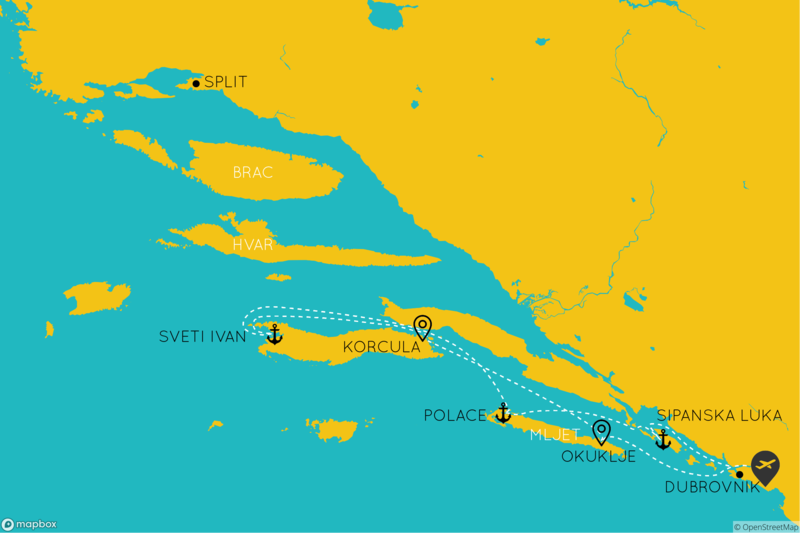 Alternatively stay for a second night in Korcula Town or head to Loviste for an anchorage with less distance to cover! Today you’ll start to head back in the direction of Dubrovnik. Situated in the middle of stunning National Park on Mljet, you will find Polace perfectly located between Korcula and Dubrovnik. Here it’s all about the natural beauty: simply anchor your yacht and take in the view or head to shore where is the option to hire bikes and cycle through the national park. Whether biking, hiking or taxiing, visiting the nearby monastery in the middle of a lake on the island is a spectacular excursion (it’s on an island within an island). With a narrow and picturesque bay, Sipanska Luka offers a beautiful location to spend a night. The angle and shape of the bay means that the anchorage is extremely sheltered and comfortable in all wind directions except from the NE. Head ashore for dinner to Kod Marka for traditional dishes including Peka and fresh fish cooked to perfection. Return to Dubrovnik by 5pm stopping via Lopud or Kolcep for the afternoon for a swim and even lunch on shore before returning. Then head into Dubrovnik for dinner in the old town to complete your week of sailing in style. Explore Dubrovnik’s city walls if you haven’t already and book dinner on the waterfront.